Finger pain refers to any discomfort you experience in the joints or tissues of your fingers. The severity may vary, but the pain is usually described as aching, throbbing, tingling, stiffness or soreness. Your finger is made up of bones, nerves, muscles, blood vessels and skin. The point where two bones meet is called a finger joint and it consists of ligaments, cartilage, tendons, and fluid-filled sacs called bursas. These finger joints will also have synovial membranes and fluid whose job is to keep your joints lubricated. You can feel pain sensation due to an irregularity or inflammation to any of these structures in your finger. The inflammation, irritation and pain can be the outcome of several mild to severe health conditions or diseases. Moreover, you may experience pain in your fingers because of a degloving injury that damages and separates the top layer of tissue from your finger. Osteoarthritis, age-related tear or other similar conditions may cause pain. Inflammation of a bursa sac may produce finger or joints pain. Invasive skin infections like cellulitis can affect your fingers and cause pain. Any swelling on top of a tendon due to ganglion cyst or benign growth may cause pain. A Staphylococcus aureus bacterial infection can cause severe finger pain. Infection around the nail, such as paronychia, can be a reason behind your finger pain. Septic arthritis and rheumatoid arthritis cause inflammation and pain in fingers. Carpal tunnel syndrome in which the nerve in your wrist area are compressed due to wear and tear or repetitive activity. Cervical spondylosis or degenerative disc disease in the neck may cause nerve damage. Any neck injury will affect the nerve and ultimately cause pain and numbness in your fingers. Nerve compression or entrapment may well be the underlying cause of pain in your fingers. Avoid specific activities that cause or aggravate pain. Take sufficient rest after injury to let your joints recover. Stick to mild stretching exercises to keep your joints moving and don't stretch forcefully. Switch to less stressful activities, for example, gripping a big handle will be less stressful than a small handle. Avoid heavy painkillers to mask the pain. This often makes you forget about the pain and you keep performing the same activity that has led to the pain in the first place. 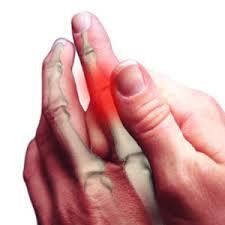 Make use of prescribed anti-inflammatory medication to relieve pain in fingers. Olive oil has the potential to prevent proinflammatory enzymes and is a good way of relieving painful finger joints. Using honey and cinnamon will speed the healing process, as honey contains antiseptic qualities and cinnamon offers antioxidants required for relieving painful joints. Soak your fingers in Epsom salts to reduce inflammation and pain. How Is Finger Pain Treated Medically? Home remedies often help reduce pain, but sometimes you need to consult your doctor to treat your condition medically. This is usually the case when an injury leads to finger pain and the swelling or the pain persists after 2 weeks of home treatment. You need to look for a medical treatment if you witness tingling and numbness in your fingers or you find it difficult to straighten your fingers. Your doctor will prescribe painkillers to make your finger pain manageable. He will also look for the underlying cause to identify the best way of treating your condition. Depending upon the causes, they may suggest other treatments, such as hand exercises, gear-like splints or surgery.